You are here: Home / Health / Is FIV Really Feline AIDS? Is FIV Really Feline AIDS? 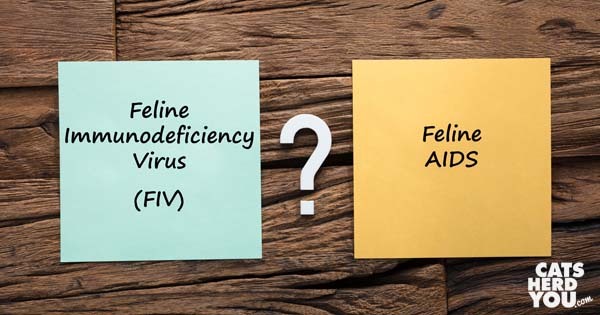 There’s a lot of confusion between feline Immunodeficiency virus (FIV) and Feline AIDS. Many people aren’t sure if the terms are the same or different, and they use them interchangeably. Let’s look a little closer into when when it is correct to say a cat has FIV and when it is accurate to say they have Feline AIDS. What are FIV and Feline AIDS? Feline immunodeficiency virus (FIV) is a virus transmitted between cats primarily by deep bite wounds. Less often, a mother cat transmits the virus to kittens during birth or through her milk. FIV is a feline-specific virus that can’t be transmitted to other species, so humans can’t catch it. When a cat first catches the virus, it multiplies rapidly, and the cat’s immune system creates antibodies to try to fight it off. The cat may have a temperature or poor appetite the same way he would if she picked up any other virus and her systems was hard at work against it. The cat’s immune system can fight off most of the virus, but part of it mutates to hide from the immune system response. When the cat’s immune system finishes doing its work on the part of the virus it can find, and the cat feels better again. At this point, the cat doesn’t seem sick at all, even though FIV is now hiding in his system. During the second stage, the virus slowly works, attacking the cat’s immune system and ability to fight off infection. This process can take as 10 years or more, with the cat living an apparently healthy life in the meantime. Cats who live comfortably in homes with good nutrition, vet care, and little stress often have the longest time symptom-free, and can live normal lifespans of 15 or even 20 years. There are times when people unknowingly adopt cats carrying the FIV virus and aren’t aware that the cats are even carrying it since cats can seem healthy during these years. Cats who carry the FIV virus and live difficult, stressful lives are likely to see the virus progress faster. For example, feral cats who live without shelter or adequate nutrition could have immune systems weakened by the virus in months or a few years. 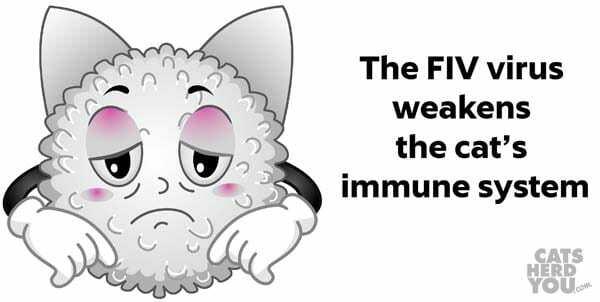 FIV slowly kills off the immune system until it is no longer able to fight off opportunistic infections. At that point, the cat is has a feline acquired immune deficiency, or Feline AIDS. When the cat is exposed to another disease, the cat will have no immune resources to fight it off, and that secondary disease can be fatal. Saying Feline AIDS isn’t accurate for all cats who carry the FIV virus. It only describes cats who are in the third stage of the illness. Generalizing that cats who test FIV positive all have Feline AIDS is like saying everyone who has cancer has stage 3 cancer. There are thousands of adoptable cats out there carrying the FIV virus, and saying they have Feline AIDS alarms families who might otherwise be be interested in spending a happy life with them. 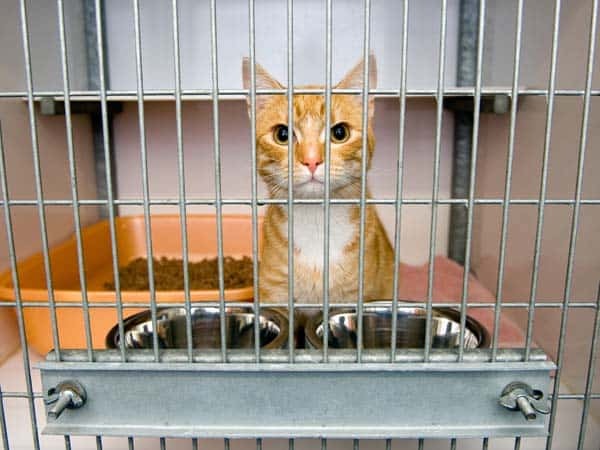 Feline AIDS sounds like something that humans can catch, and the public, who don’t know any better, are unlikely to a adopt a pet they think might make them sick. People may also be afraid of adopting a cat who might make their other cats sick. The FIV virus isn’t transmissible to other cats through casual, friendly household contact, making cats with both positive and negative FIV statuses able to live together without risk of transmission as long as the cats get along with each other and don’t fight. Fighting is when the deep bite wounds that transmit the disease happen, so if cats are friendly with, they can be great companions no matter their FIV status. 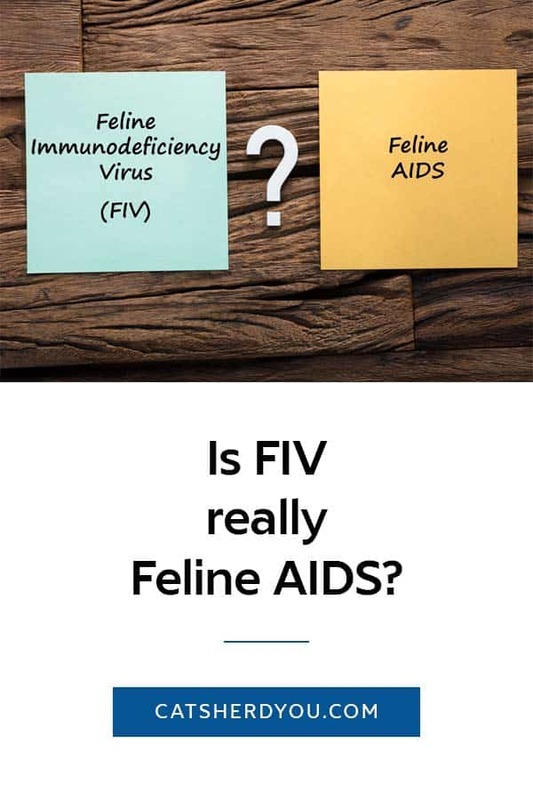 Understanding the facts about FIV helps us all understand why there is no need to say Feline AIDS to describe cats who carry the FIV virus. 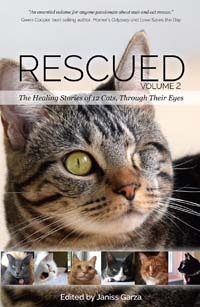 The Veterinary Journal, Transmission of feline immunodeficiency virus (FIV) among cohabiting cats in two cat rescue shelters. Thank you for clearing up that misconception. well done – and we learned something as we didn’t realize vets broke it into 3 stages. I learned something too. I was never clear on the distinctions. Okay, those illustrations are super adorable..
GReat information. Thanks for the great explanation. That was wonderfully done and should be useful to many potential adopters! So interesting! Thank you for clearing up the confusion. Thank you for telling us the difference. Whenever I look at a great cat at the shelter I worry when they say they are FIV positive and require special vet care, that makes me do a double take on whether I want to take that cat home or not. But also, we are never sure new cats will get along with each other. They either need to have meet and greets with other household cats (and dogs for that matter) or at least trial periods to see if they get along before any dangerous fights happen. They do this with dogs at most shelters. I theoretically could bring home a new HIV or healthy cat and keep them separate from my current cat and/or dog and keep the new family member in a large crate or a room separated by a screen door for a couple of weeks. The shelter could loan them the large crate for about a week or two to make sure they got along. Then the adoption would happen if all goes well. They have so many cats at shelters that people are afraid to adopt. And not just because of HIV. But because they are not sure their current pet will accept a newcomer.